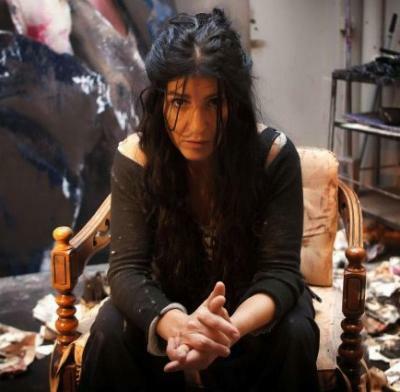 The Spanish artist Lita Cabellut was born in 1961 in Barcelona, where she grew up in a poor Gypsy-environment. Her work is deeply intertwined with her memories of the old area of Barcelona, El Raval, with proximity to the docks, La Bocquerai market, Las Ramblas and Sant Antonie market, replete with pickpockets, street performers and of course, prostitutes. She was first exhibited at the age of 17 at the Town Hall of Masnou, Barcelona. At 19 she decided to leave her native country Spain, for new challenges in the Netherlands, where she studied between 1982-1984 at the Rietveld Academy in Amsterdam. Lita Cabellut is now considered a painter with a unique pictorial language. She puts a contemporary spin on the fresco-technique and expresses an immensely enjoyable, communicative and recognizable “Cabellut-palette.” Lita Cabellut's “human-faced” paintings are exposed over the globe, in New York, Dubai, Miami, Singapore, Hong Kong, Barcelona, London, Paris, Venice, Monaco, Seoul and many more cities.